A new cafe will soon offer up handmade doughnuts, coffee and more in Ballston. Good Company Doughnuts and Cafe plans to move into a space at 670 N. Glebe Road, just under the 672 Flats apartments, according to co-founder Charles Kachadoorian. Kachadoorian told ARLnow that the restaurant is targeting an “early 2019” opening date, after signing a lease at the new building this summer. He expects the cafe will offer a full range of soups, salads, sandwiches and other “light fare,” with some limited dinner options as well. Kachadoorian added that the cafe struck a deal with Chicago-based Intelligentsia Coffee for its brews, and will even someday offer craft beer, wine and cocktails for thirsty customers. “We’re a family business, and we’re really excited about bringing the food we’re passionate about to the community,” said Kachadoorian. 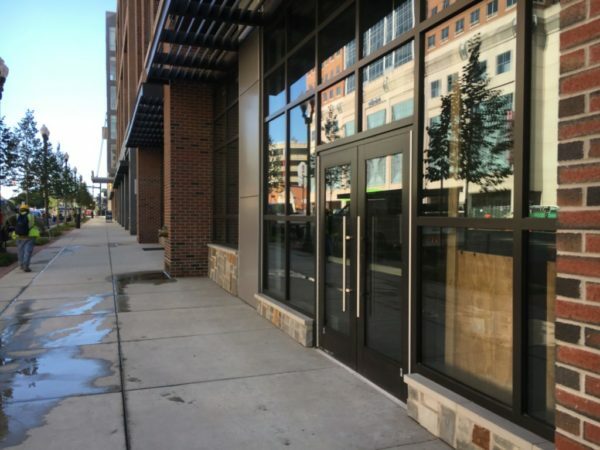 Depending on when Good Company opens its doors, it could become the first retailer to set up shop in the new 672 Flats building, located just across from the Ballston Quarter development. The apartments have space set aside for several other businesses on its ground floor, though Kachadoorian was unsure if others will join Good Company in the near future. A spokeswoman for the Chevy Chase Land Company, which purchased the development last week, said they have yet to announce any additional retailers at the site.